place really lives up to its nickname, "The Pearl of the Pacific". When planning your vacation, you sometimes have to decide: sun and sand or culture and history? Mazatlan is one of the few destinations that offer both options. In the new Golden Zone, developed in the sixties, you'll find a lot of hotels, shops, bars and restaurants scattered along idyllic beaches; at the same time, in Old Mazatlan's historic center or life continues as it did before the tourists arrived to markets, cafes, churches and squares shaded traditional neighborhoods. The influence of European immigrants is evident in local traditions, particularly in a type of music that became the hallmark of the state of Sinaloa. Do not be surprised if suddenly you find yourself dancing to the band, a melody latina injecting energy into the traditional German oompah music called. Typical of Sinaloa, the band was created when the Bavarian immigrants came to the turn of the twentieth century. Soon you will realize that mazatlecos, as they call themselves local, are friendly, funny and helpful. Any time of year is good to hang around cafes and restaurants. However, you can also join the most famous celebration of the people, during which local celebrate and dance in the streets: the carnival, equaled only by that of Veracruz. The mazatlecos are proud of the restoration of the nineteenth century mansions that are situated in the historic center. Imagine combining the architectural cake Miami Beach and wrought iron balconies and patios languid New Orleans colors. The mazatlecos call this tropical neoclassic style. The foodies will love the variety of restaurants can be found here, from rustic huts on the beach to viewpoints illuminated by candlelight. The shrimp are served fresh, and talented chefs have mastered populated local recipes that contain them. Enjoy these seafood with coconut breaded, marinated in lemon juice (in ceviche), fried with garlic and butter, flamed with tequila, served with a devil sauce or simply steamed. Easy to get to Mazatlan; you can do so through highways, international airport or marina. For the night, you will find from small family hotels to luxury properties in the Golden Zone, complemented with gourmet dinners and spas. 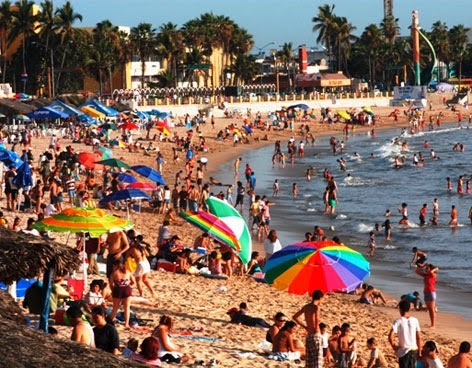 In settling just south of the Tropic of Cancer, Mazatlan is semitropical climate throughout the year. The temperature ranges from 25-30 degrees Celsius. With an average of 300 sunny days per year, here you will find always beach weather.Do not forget your sunscreen!